The bar is now open! | Renkoo: Volunteer! Renkoo is all about friends, planning events, and managing your offline lives. Sometimes though, it’s worth the time to make something just for fun that you and your friends can use. That’s what Booze Mail is! 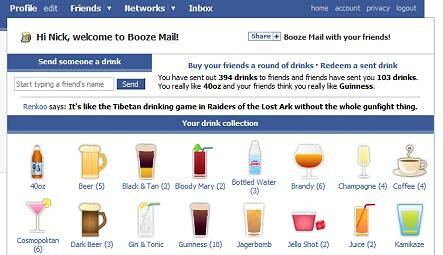 Booze Mail is a Facebook application built on the recently released Facebook Platform and hosted on Amazon’s EC2. What that means is, your friends on Facebook can now share the Renkoo! Booze Mail is about one simple thing: we all love tasty beverages, whether it’s beer, mixed drinks, juice, soda or the infamous Pan-Galactic Gargle Blaster. We also love sharing that with our friends. With Booze Mail, you can send your friends a drink, send groups of friends a round of drinks, send them a message, and then your friends have the ability to redeem the sent drink. 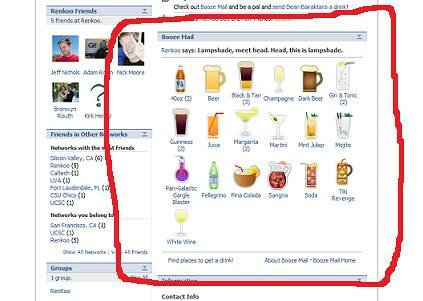 (You can actually send anyone on Facebook a drink, but we’ll let you figure out how to do that.) Also, if you like stats, check this out! Why on earth did you make an application for sending…drinks??? We just launched our app as well, it shows our wine offering for the day. Any chance of seeing other drinks added – or addable by users? I’d like to see flagons of mead , test tubes of Soma, and a wider range of whiskeys (Scottish, Irish and other lesser brands). Soft drinks should have chai, lapsang souchon tea, blood (y’know, for Goths), synthiKaff, Milk+drencrom for my droogies, maybe somethig a little heavier, like ayahuasca or smart drinks like a nice choline-pyroglutamate -ginkgo biloba in guava-strawberry juice… and many more I’m not f=drunk enough to rmemeber! Hic. Can you please make a “blueberry tea” drink served in a brandy glass with an orange slice? thanks!